The eighteenth-century British master Thomas Gainsborough (1727–1788) is celebrated for his portraiture and for his depictions of rural landscapes. 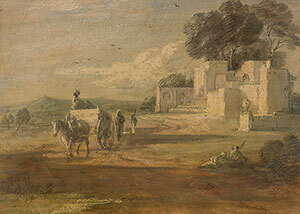 Thomas Gainsborough (1727-1788), Landscape with Horse and Cart, and Ruin, 18th century, oil paint , watercolor, lead white chalk, over black chalk; varnished, purchased by Pierpont Morgan (1837-1913) in 1909. The Morgan Library & Museum. III, 55. Photography by Steven H. Crossot, 2014.